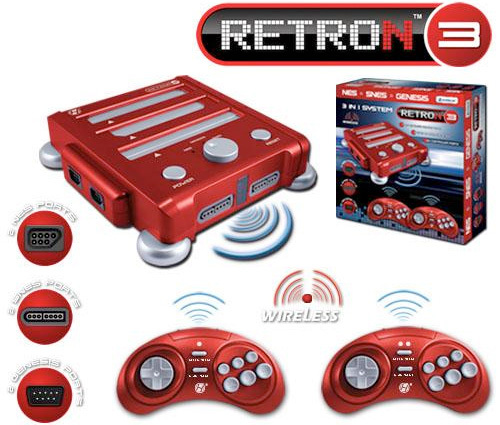 RetroN 3 Conglomerates Your NES, SNES And Sega Genesis Consoles | OhGizmo! Even with the Virtual Console on the Wii, I still keep my Super Nintendo hooked up and running because a) I have no desire to pay for any of my SNES games again and b) I prefer playing classics like Super Mario Kart, F-Zero and Star Fox with the original SNES controllers. If you feel the same way, but also have an NES and a Sega Genesis console taking up space (and connections on your TV) you might want to consider this RetroN 3 from Hyperkin. It’s basically an NES, an SNES and a Sega Genesis mashed up into a single, space-saving console. It doesn’t play ROMS or anything like that, so you’ll still need to hold onto your old game carts, and if you don’t like playing with the 2 included wireless controllers, you can plug in the controllers from your original consoles since it includes 2 ports for each of them. It’s also got composite and S-video AV hookups, and is available in your choice of red or black for just $69.99. Why doesn't anybody ever do this type of thing for Colecovision? Oh man…if they had thrown a Nintendo 64 in there, I'd be all over that like white on rice.